Upgraded technologies have been fitted to rooms along with a new colour scheme. Iconic Sydney hotel Sofitel Sydney Wentworth has pulled back the curtains on a multimillion dollar refurbishment and upgrade to its 436 guest rooms and lobby area. 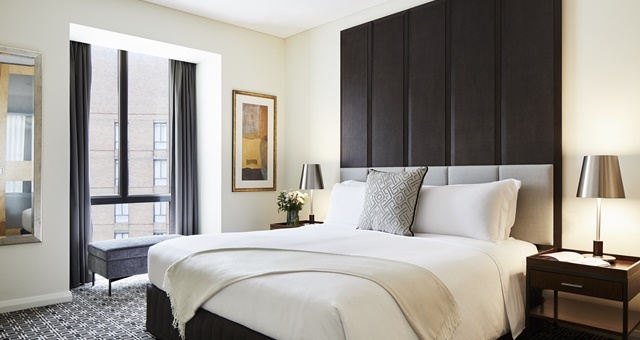 Completed over six months from October 2018, the biggest change comes to rooms and suites, which have been fitted with a new soft-grey colour scheme to brighten the overall look and feel of the rooms. New carpets have been installed, along with upgraded bedheads, artworks and high-backed armchairs and matching ottomans. Technology has also been improved, with new televisions featuring inbuilt Google Chromecast now in place, allowing guests to stream their own content directly from personal devices. WiFi across the hotel has also been upgraded, which the hotel says now better allows it to compete with other leading hotels in the area for guest connectivity. New carpets have also been fitted to the lobby area, along with new furniture and artworks in the hotel’s adjoining gallery and library off the lobby. “Every Sofitel exudes a refined and understated sense of modern luxury, and this grand old dame is no exception,” said Sofitel Sydney Wentworth General Manager, Philip Logan.